I love having backyard chickens but hated the task of cleaning the water bowls and refilling them. Vacations were hard to plan because finding people that were available to keep the chickens watered was not easy. Summers were the worst because the chickens needed more water and the water in the dish would evaporated more quickly due to the heat. Not to mention how unhealthy it was for our dogs, goats and other farm animals to drink the water that was full of bird droppings! 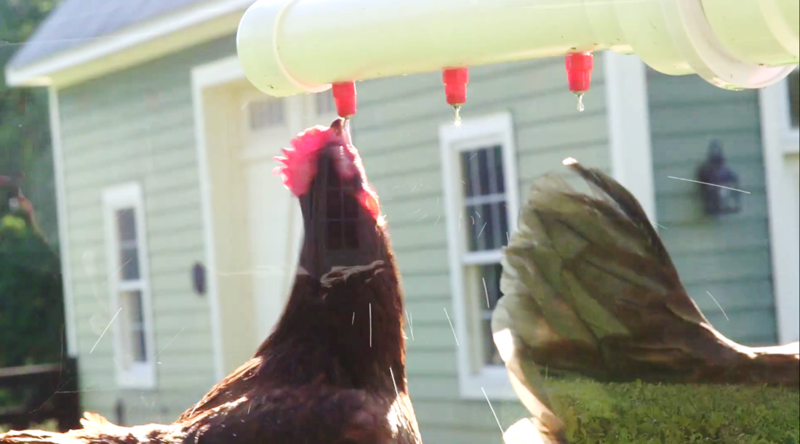 I set my mind to build a chicken fountain waterer system that was easy to install, provided a constant flow of clean water, and was completely maintenance free. I spent many nights in the barn working on this concept and, quite frankly, failed a number of times. Then it hit me! Why not just make a passive flow unit that could be hooked up to the garden hose? 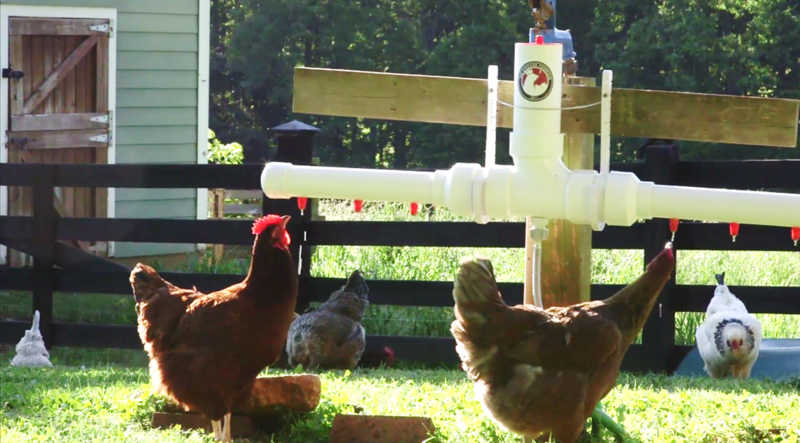 There wouldn’t be pressure regulators to fail, no start up high pressure, no manually refilling buckets…Just cool, clean water every time the chickens went to drink. I finally perfected the unit and felt so strongly about it that I wanted to make it available to every flock owner that hates cleaning the mess of dirty, unhealthy water dishes. Currently we have 3 types of chicken waterers in production: the “MINI” System will handle 2 to 6 birds; the “STANDARD” System will handle up to 4 to 16 birds; and the “MEGA” System will handle up to 45+ birds. Additionally, we can customize a unit to meet the needs of your flock. All of our units are a “semi-sealed, passive flow” design which means that the unit is not under any pressure. Water flows to the drip heads only when your chicken demands water. Our semi-sealed fountains make it a snap to add Wazine-17, apple cider vinegar or supplements to your flock’s water. Each unit is constructed of heavy duty schedule 40 PVC pipe and is fully tested prior to leaving our farm.